Though he acknowledged that the reasons for funding problems at both the state and city levels are “complicated,” he repeatedly singled out the state transportation agency as an institution that would need radical change before the problems could be fixed. Bragdon said that though there are “good people” at ODOT, they’ve failed to create good governance. “If good people can’t make the system work, then you have to say, ‘There must be something wrong with the system,'” Bragdon said. By arguing that ODOT needs major change before it gets any new revenue, Bragdon differed from the consensus of liberal politicians in Portland and the rest of Oregon. “Unless you get the governance right, the decisions won’t be right and the money won’t be well-spent,” he said. Bragdon said ODOT’s problems had contributed to what he described as two major failures: the decision by legislators to kill a four-cent gas tax increase earlier this year, and the 2014 collapse of plans for a new Columbia River Crossing even after $200 million in taxes had been spent on it. The transportation package failed for multiple reasons, he said, but “it didn’t help that the state transportation department had been promoting estimates of greenhouse gases that were wildly inaccurate,” Bragdon said. ODOT had been falsely calculating that widening highways would reduce greenhouse gas emissions over the long run. After environmental watchdog organizations objected, ODOT Director Matt Garrett chalked it up to something resembling a mathematical error. Bragdon brushed that off as a face-saving excuse. If the Washington Senate had signed off on the CRC deal in 2013, he said, the state DOTs would be asking for more money by now. 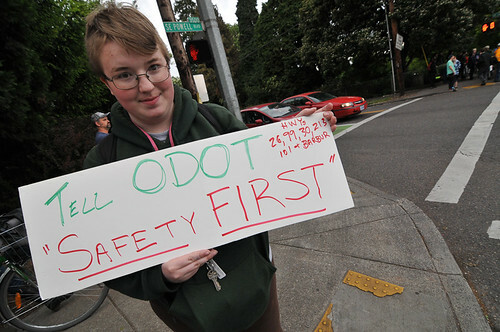 A protest last May of ODOT-controlled Powell Boulevard. The agency has avoided narrowing the lanes to slow traffic speeds, even though traffic typically exceeds the speed limit. Bragdon’s prescriptions for change at ODOT, he said, would be very difficult to execute but are “pretty simple” in nature. He based his recommendations on recent reforms in California, Massachusetts, Pennsylvania and Greater London. First, he said, the state should not be in the business of managing local roads. Oregon’s confusing “mashup” of responsibilities for different streets prevents ordinary residents from knowing who they can hold accountable for problems, he said. Second, Bragdon said ODOT needed to change its “totally random allocation for funding” various local jurisdictions. He compared the state’s transportation funding system to a system that would fund public education based on the decision of an executive running its university system. “50 percent to universities, 30 percent to community colleges, 20 percent to K-12,” he joked. Bragdon closed his prepared remarks by invoking Oregon’s change of course to kill the planned Mount Hood Freeway in 1974. 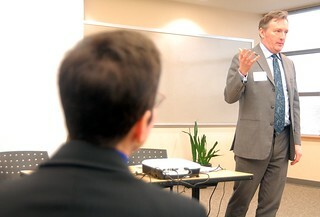 Some of the people who changed Portland’s direction in the 1970s, Bragdon said, were in the room on Friday. Others were the grandparents of people in the room. Guessing Kate Brown won’t be taking his calls anymore in the future. whose calls? Garrett’s or Bragdon’s? Gee, I don’t know. The guy who’s name is in Paragraph 2 and the main topic of the article? But…I could be referring to Donald Trump, too. Don’t know…..
I’d take what Bragdon says with a huge grain of salt. He’s been a legislator and a policy leader at a planning agency. From what I see of his resume, he’s not been in an executive or management position in an agency with substantial operational or implementation responsibilities. It’s really easy to have “ideas” but the execution, implementation, and operations can be really difficult. I had a long career in planning and learned a tremendous amount by working for a few years in a position where I was responsible for operations. I’m not sure Bragdon would fair very well if he were ODOT director. To be sure, I’m not a huge fan of ODOT and I’d do some things differently. I appreciate Bragdon’s perspective, but I don’t think he appreciates the difficulty of satisfying all the interests that ODOT and its director must satisfy. How many years will it take until TV Highway no longer has deaths? Four have died on it this year. What “interests” are these? Perhaps the problem is these “interests”. Whatever happened to a transportation agency actually doing transportation work? Just PBOT, ODOT cannot successfully execute it’s core work it’s so rotten with planning, environmental nonsense, consultants, etc., etc., etc. The interests are urban and rural, freight, bicyclists, property-rights advocates, developers, anti-developers, conservationists, public transit advocates, city leaders, county leaders, etc. Every issue and project has people wanting something else. Yes, I have issues with hearing “I expect a lot from you,” Bragdon told the crowd. “Don’t let me down.”, from a guy who fled the state for a fat pay check. Incompetence OR dishonesty?? We have to choose only one?? Which one causes the removal of bike lanes? Why hasn’t ODOT fixed crashed corner in Raleigh HIlls? It is at Oleson Road which goes to downtown Tigard, has numerous grocery stores, and is one of the worst intersections in Oregon. Motorcycles, cars, and brush have burned there even in 2015. Are you referring to Beaverton Hillsdale and Oleson rd interchange? I look at that and see an opportunity for a large roundabout. That simply requires the acquisition of the parking lot which houses subway and a few other marginal strip mall stores. Roundabout work quite well with multiple inflows/outflows. They aren’t too popular with the seniors though. Stoplights apparently are however. I don’t think it will be done until 2030. 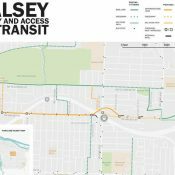 Phase 1 (Oleson Realignment) still needs funding to get to 100% design, ROW acquisition, and construction. After that, two more phases….sigh. If I’m right, and it gets constructed by 2030, it will have been about 40 years from the time they first started looking at it until completed construction. rick says its one of the “worst intersections in Oregon?” Nah, I don’t think so. Finally, someone publicly shouts the truth about the emperor’s new clothes. 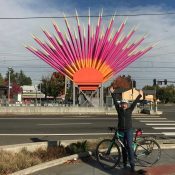 Garrett has been running ODOT for as long as BikePortland.org has been providing online bike news. Does anyone need guess which one got better over the last decade? The agency is overrun with process consultants and “high priority” efforts to appear multi-modal, intermodal, or whatever other buzzword satisfies the Governor’s office (or FLO, as the case may be). For every bus pull-out or bike lane constructed, millions more are spent on out-of-state conferences (vacations), retreats, forums and consultant contracts for management. Legislators would blanch to learn the amount of money, time and resources spent on internal meetings, which draw hundreds of regional management staff back and forth to Salem a half dozen times or more each month. Millions spent on a state data center and videoconferencing equipment were wasted as ODOT vehicles carry one person each back and forth. Outside of Portland and Salem, ODOT has absolutely no engagement in transit. Employees are not encouraged to use alternate modes. ODOT facilities are not located near transit lines. The same goes for bicycles, rail or ride-sharing. The agency has nothing invested outside highways. BTW: The legislatively-mandated OReGO program is a complete failure, evidenced by the low participation and lack of interest in rural Oregon, where the program supposedly would have the most benefit. Look for the program to be shelved due to exorbitant operational costs and public distrust in the agency. 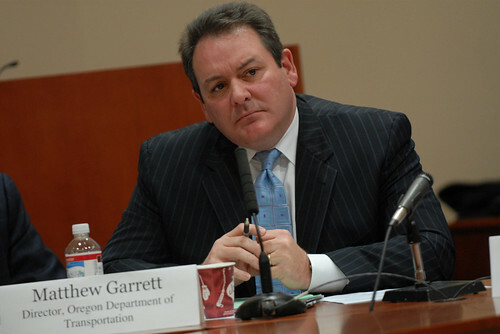 As for Garrett’s executive management team, it is insular, myopic and stunningly unqualified to manage. Explain how Travis Brouwer, a 30-something former legislative aide with no management experience rose to become the Assistant Director of the agency. Explain how Hal Gard was appointed to lead the agency’s Rail and Transit divisions, despite having no professional experience in either industry. Explain how Jane Lee was appointed to lead the agency’s HR division with no industry experience after stumbling badly as the Region 2 manager overseeing the Pioneer-Mountain Eddyville project that more than doubled its original construction cost. The list of maligned managers goes on: Troy Costales and the Transportation Safety Program; Jerri Bohard and the Transportation Development Division; and James Whitty and the Office of Innovative Partnerships. That last manager should have his division renamed the Office of Innovative business trips to Europe and Hawaii. (Read: Paying by the Mile http://www.wweek.com/portland/article-25020-paying_by_the_mile.html). Cheers to David Bragdon for calling out ODOT; for reminding everyone responsibility lies at the feet of Matt Garrett; and for challenging Gov. Kate Brown to make the changes necessary to renew trust in the agency before committing to another funding package in 2017. Perhaps every government and department should be counting and managing single-occupant vehicle miles, for commutes as well as meetings and field trips. How many e-bikes are in the city fleet? I’ll bet even ODOT has a significant amount of state vehicle trips under 2-5 miles. Yes, they need trucks sometimes, but in fact you can carry a few cones, measuring tools, and marking paint on a standard bike with a rack. But how many government small pickups could be a longtail or longjohn cargo bike or even velomobile? But, such vehicles would be largely symbolic compared to the total VMT due to public employees commuting. Bravo David Bragdon. Now is Kate Brown’s opportunity to turn the page from Kitzhaber’s OTC and ODOT leadership failures. We should have the most innovative and progressive state DOT in the country. Did anyone get fired over the CRC disaster? Its time to clean house. It’s time to gut ODOT and start from scratch. That may be Bragdon’s bridge to burn but it hardly ends there. Oregon’s political system and public services are deeply dysfunctional all around. This is the state where DMV jokes really are true (and nobody’s laughing). This is the state that gave us Jeff Cogen and John Kitzhaber, two politicians who couldn’t manage the separation of romance and state. This is the rainforest city where it floods if it rains and the leaves are falling. This is the temperate city that estimated a cost of $300M to plow fewer streets than Minneapolis, which spends $9M. This is the city that can’t propose a street fee without fudging the numbers. And for the perfect combo, this is the city where everyone with any income pays an “arts tax” except for retired public servants. But let’s just single out ODOT. An apples vs oranges comparison based on a false number that was retracted. Portland also has 2.5 times more land area than Minneapolis. This kind of anti-government “I’ve got mine” mindset has gutted the american dream. It’s a bureaucracy, what do we expect? If anyone can, please identify one single successful governmental bureaucratic organization. Just one. This is nature of bureaucracies, especially government bureaucracies where there is zero incentive to innovate, let alone be responsible with our dollars. Heck, look at PBOT – wasting millions and millions and millions on all sorts non-mission work, including hiring diversity and inclusion staff and management. It’s really quite maddening and I am surprised that so few people actually care, let alone get angry about it. define “success.” how are you going to execute large scale collective activities without some structure you are then going to label a “bureaucracy”? ultimately the role of government is to serve the collective needs of the people. you can call one department “transportation,” but transportation does not occur in a vacuum. But, every city/state/county/large private corporation has a bureaucracy. – ODOT’s own safety data from 2005 contradicts ODOT in 2013. I went to Salem for meeting after meeting on the CRC where I heard Mr. Garrett and his ODOT staff tell lie after lie to the public. His co-worker Kris Strickler (CRC director) lied just as much. Why they still have jobs connected to government is a crime, and a crime supported by the Democrats still in power who had documentation of all the lies. I ran for office against Tina Kotek who was the legislative lead on this project. She lied on camera that she answered questions of Rep. Lew Frederick and the public. She even admitted that her biggest mistake was not scaling back the CRC and better explaining the project. Questions were not answered. Questions were responded to with lies. Here’s another set of lies about the design that was selected not through any process or bidding. It was done with just opinion. ODOT staff lied that any other design was “too complex”. That story changed when details about complexity fell apart. I will never forget ODOT’s promise to include an arterial bridge option across the Columbia in the Draft EIS after a virtual tie vote on the matter by the Governors’ I-5 Task Force. That was 2002; the promise was never kept. The less money ODOT has, the better. Bragdon also said CRC activist questions were “stonewalled”. They were stonewalled by ODOT and 94% of Oregon Democrats. Watch Democrat Speaker Kotek defend the stonewalling and “dishonesty” Bragdon speaks about. The public did not like the CRC answers because they were lies. In 2013 only 3 Democrats voted NO on the CRC. 45 Democrats voted yes to the final and only CRC vote. They voted yes to the lies, stonewalling and incompetence of ODOT’s CRC. In conclusion….As Bragdon said: ODOT will remain the same unless there is leadership change. One solution would be if the bike community unites with all community groups to help elect progressive democrats or green party lawmakers to the state level. This was a topic of Mr. Maus at a recent wonk night. Ties it up nicely. When I asked Matt Garrett “when are we going to get rid of studded tires?” his response? “Talk to Les Schwab” He folded when confronted by special interest. When I gathered signatures in Salem, for the ballot initiative to ban studded tires, ODOT employees were lined up to sign. The ODOT employees expressed to me they hated studded tires and it was making their job difficult to maintain Oregon’s roads. When pursing information from ODOT, I had to request 3 or 4 times to get copies of a report on the true impact of Studded tires on Oregon’s roads. I thought they would be excited to make their job easier, but they seemed uncooperative. They never testified at Transportation Committee meetings regarding the impact of studded tires. Only 10% of drivers use studded tires yet cause millions of dollars in road damage. I don’t have a positive perception that ODOT is taking care of it’s job, protecting taxpayers money. Did you ever keep notes or a blog or documentation on how you started round one. What if another person or group wishes to give a try to round 2 to defeat studded tires. ??? He was so spot on in his assessment. It makes me think there might be a glimmer of hope that the system can be changed if someone who has been enmeshed in it for as long as Bragdon has, can have the vision to see the problems and the guts to call them out. Too bad he doesn’t work in the system anymore. I just don’t understand how one of the bluest states in the county, with a population centered squarely in Portland metro can’t have a DOT which does cool and innovative thinking. Maybe it is not the legislatures fault, maybe it is just in ODOT. Maybe it is just the nature of all DOTs? I am not an expert here. Lastly, as others have said, it is shocking that no one has been canned as a result of the CRC. Dem’s need to show that government is accountable to the people if they expect to continued support for their claim that government can do good things! My answer to your question. This “stonewalling, opaque, dishonest or incompetent” nature is not just a DOT thing. Its the lawmakers who stonewalled CRC concerns for 8 years and defended ODOT after the CRC died. (Vimeo URL above) Lawmakers in OR still in 2015 produced as DB said “was old school”… ” no performance measures, “Big road widening at the edge of town”. “key projects for key legislators if they vote the right way” watch him answer here why we can’t have nice things in OR…. and I do wonder what he thinks of the milage surcharge system currently under review. I think it stinks and will not pass muster with the voters. The mileage surcharge proposal is all designed to push folks over to a higher gas tax. No. The mileage charge is designed to penalize those with high mileage vehicles and give a discount to those with gas hogs. Do the math. Oh.. The studded tire debate. The last bastion of the conservative eastern/middle Oregon world. I was introduced to studded tires in middle Oregon and western Washington. You know….the “independent” areas. However do I survive with awd and 10ply tires from big o while traveling through the states I’d Wyoming and the rocky mountains? Yeah…studs are for incredibly lazy and incompetent drivers. The question is whether Kate Brown is interested in Portland voters opinions. It’s obvious that ODOT needs to be reset from a clean slate. If we can make it an election issue maybe we’ll see some heads roll. What the hell is he talking about? Downtown Milwaukie has 3 stop lights with crosswalks across McLoughlin. Not to take away from the larger point that state facilities and their management can affect cities, but that claim is either way out of context or just wrong. I was going to say the same thing. There may be situations where it’s clear that ODOT is working against the local citizenry, but the crossing from downtown Milwaukie to the Willamette waterfront is not one of them. I think what he’s trying to say is that, if Milwaukie residents want a new stop light to get across McLoughlin, they’d need to get ODOT to put it up which means they wouldn’t get their stop light. Here’s a better example: Hall Blvd runs through Tigard. The bike lanes are routinely choked with glass, landscaping debris (often from ODOT’s landscapers), gravel, construction debris, dead animals, etc. City of Tigard is not allowed to touch any part of Hall Blvd to pick up piles of glass, or dead animals, or strewn construction debris, because Hall is ODOT’s responsibility. ODOT won’t come out and spot clean troublesome areas, they sweep the road on their schedule and that’s it. ODOT has tied the City’s hands as far as maintaining clear lanes for all travel. I’m sure that, LO THESE MANY YEARS AGO, Hall Blvd was the I-5 or 217 or 8 or 10 of its day and served that purpose. Here’s another one: Upper Boones Ferry Rd is a state road, that runs through the City of Durham. Like Hall and the City of Tigard, when there are issues with the maintenance of the road, the Cities are not allowed to do anything about it, and have to wait for ODOT to get it on their schedule. Same problem as with Hall Blvd. I totally agree with David Bragdon about ODOT’s dishonesty and incompetence. As Joe Rowe says above, there is plenty of proof. 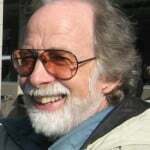 However, when the chips were down, David Bragdon was responsible for pushing the Columbia River Crossing through Metro, and he did it time after time after time, feeding the dishonesty and corruption. 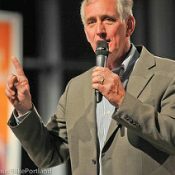 When David was President of Metro, you could get him to take on ODOT publicly, but not the special interests who were benefiting from the CRC, the consultants who got the $200 million, and the bridge and road builders, and The Oregonian and Tribune (Pamplin’s Ross Island Sand and Gravel), and certainly not David’s former employers at the Port of Portland who were instrumental in pushing the whole boondoggle. Maybe Kate Brown will wake up to her problem at ODOT and its relation to climate change — or to the dishonesty and incompetence? Maybe she will appoint a Board at Tri-Met and at the Port of Portland who want to work together with Metro and the City of Portland to build a great City and State. Transportation spending, and building urban areas that are walkable and bikeable, and have great transit systems, are not Kate’s area of expertise and interest. Smart development of the growth that is coming to this State is not yet on her radar screen. 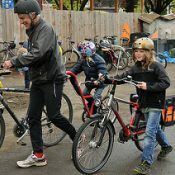 Michael Anderson is a great reporter and understands the issues and the history — thankfully he is still at Bike Portland. Fire Garrett, Kate, and bring back Lynn Peterson from Washington State to initiate the reform that is so clearly needed. ODOT is the elephant in Portland’s living room. Time to clean house. You’re righter than you may have imagined — until about 1975 Hall Boulevard was Highway 217, running from Highway 8 in Beaverton southeast through Progress, Metzger, and Tigard, moving on Durham Road and Boones Ferry Road, and ending in Wilsonville.